"Tens of thousands of users successfully downloaded the new app but, due to unknown reasons, Google has pulled it from the Market," GameStop said in a statement today. According to Kongregate's official Twitter account, the company is "working with Google to restore access in the Market." 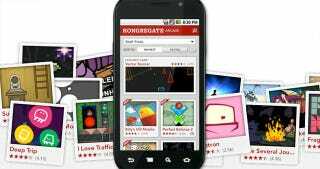 For now, interested Android gamers can grab the Kongregate Arcade app from Kongregate itself. We've reached out to Google to see what's up. And we're feeling lucky that we'll get a response.